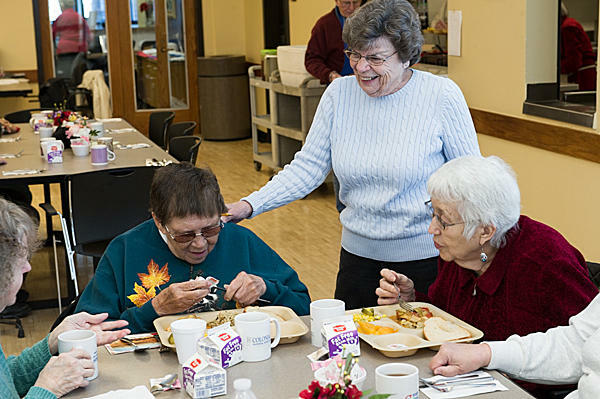 Nutrition Education is a vital part of the Volunteers of America Meals on Wheels and Congregate Dining Center Programs. In addition to healthy meals, nutrition education is an integral part of a healthy lifestyle. All of the nutrition education provided to Meals on Wheels and Dining Center participants is taught and written by Registered Dietitians. Each month, a nutrition newsletter containing topics that are relevant to the aging population is distributed to all Volunteers of America nutrition program participants. Program dietitians monitor the most at-risk Meals on Wheels Program participants, including making home visits to those at highest risk. They also conduct an on going program of nutrition education and counseling (at the Dining Centers and for Meals on Wheels participants) on a variety of topics, including diabetes, high cholesterol and cancer, with the overall goal of helping program participants maintain overall good health. The meals that Volunteers of America prepares and delivers are all low in sodium, fat and cholesterol. Each meal meets 33 1/3% of the Dietary Reference Intakes for seniors, and has less than 100mg of cholesterol, less than 1200mg of sodium, and no more than 30% of the total calories as fat calories. The meals are nutrient dense and provide many vitamins and minerals the aging population needs without adding extra calories. Volunteers of America Nutrition Services is committed to providing quality health/wellness and nutrition education programs that enhance the quality of life of each participant in our programs.On this page you will find links to various health, wellness and nutrition sites. Please visit these sites to learn more about resources that are available to you and your family. Volunteers of America is not responsible for the content of any site other than those specifically hosted by our agency.